In accordance with the global concepts for machine design based on the modular principle, the main modules, which are the same for the different types of working machines, are the electromechanical modules, also called geared-motor modules. Because of the multivariance of the task for their design, a database containing the technical parameters and characteristics of the main constructive units needs to be build. In the presented work investigated the changes of power characteristics of deep drilling package of printed circuit board’s hard metal micro drills depending on the drilling depth, cutting data and geometry of the drill. In particular studied the nature of changes in axial efforts and torque depending on the drilling depth drill with different inclinations of the spiral grooves using specially designed highly sensitive devices, enabling direct measurement method. Based on the analysis of the results of the study, changes in the geometry of existing standard drills. Proposed new construction of micro drills vary-angle spiral grooves in such a way that the angle is the maximum value at the top of the drill and uniformly decreases towards the end of the working parts. The drills are manufactured with different inclinations of the spiral grooves. Based on the experiments of them chosen more for its near standing power rates to the standard drill bit and its comparative test with a standard drill bit, bringing them up to the breakage, thanks to which the proven advantages of drills new design. Taking into account the results of the experiments proposed drill elongated structures to improve performance by increasing the processing drilling depth and accordingly the number of plates in the package of printed circuit boards. Among cavity pumps used in hydraulic drive systems as energy generators, gear pumps are the most widespread. Apart from their numerous advantages from the point of view of noisiness and the delivery fluctuation coefficient, they are inferior to others. Steps are undertaken to decrease the noisiness. According to the research results, own acoustic parameters of the pump depend on the technology and performance quality as well as on the geometrical features of the tooth profile. 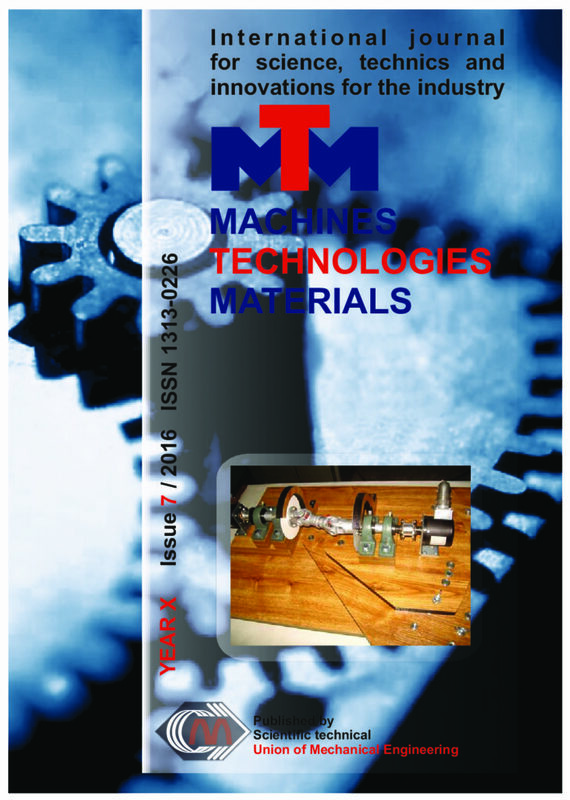 The paper is restricted to the analysis of acoustic properties of an innovative gear unit after tooth root undercutting. Acoustic properties have been described with taking into consideration induction of decision trees and decision rules. In this paper, we propose a physico- mathematical 3D model to study some of the basic features of the interaction of radiation with solid materials ( metals, semiconductors , insulators ) under the action of femtosecond laser pulses. The constructed model is a parametric model that, in particular, takes into account the dependence of the physical and chemical characteristics of the periodic nano- surface structures controlled laser irradiation parameters the polarization, angle of incidence, the energy density, wavelength, etc. The developed model is meant for the excitation of periodic nano-surface structures by electric waves which are in the process of irradiation and periodically amplified and attenuated, i.e. it holds periodic interference. Today, there is a significant interest in alternative energy sources for vehicles, as a result of continuous concern for the environmental impact and for consumption of the primary energy sources, which are limited. Diesel engines present particularly significant emission like nitrogen oxides, particulate matter, hydrocarbons and black smoke. This paper present a literature review on some alternative fuels for diesel engines, as pure plant oil, biodiesel and compressed natural gas, and their impact on diesel engine emissions. The results of experimental studies to improve the properties of the surface layers of the elements of optical glass (K8, K108, 6 8 2 K208, BK10, TF110) after their processing by mobile electron beam with density of heat exposure F = 7·10 …8·10 W/m and n -3 -2 displacement speed V = 5·10 …5·10 m / s (a reduction of residual microroughness height at the surface from 4 … 6 nm (unprocessed elements) to 0.5 … 1 nm (processed elements), the occurrence of melted layers of thickness up to 250 … 300 microns with a modified structure, which is close to the quartz glass) are presented. It was found that the improvement of these properties increases the resistance of elements to external-heat: an increase in 1.3 … 1.7 times of the critical value of external heat fluxes and the time of their exposure, the excess 5 7 of which leads to the destruction of elements and damage to the test instrument turndown external pressure 10 …10 Pa; increasing the maximum permissible values of thermal stress in the elements from 20 … 40 MPa to 90…100 MPa heating temperatures 300 … 1200 K;an increase of the probability of failure-free operation in the 2 … 2.5 times by increasing the speed of the external heating from 100 K / s to 400 K / s.
Investigated the mechanisms of interfacial interactions in composite materials based on thermoplastic matrices modified with dispersed particles of silicon and carbon-containing compounds with high energy activity. It was found that the laser treatment of particulate and fibrous particles occurs comprehensive modification of the surface layer, which consists in shaping the development of the morphology of the surface layer and increase its energy. For the modification of thermoplastic matrix including high-viscosity (polyamides, PTFE) prospectively the use of dispersed fragments of carbon fiber (CF) fraction 50-150 microns, subjected to the effects of a short pulse laser, having developed the morphology of the surface layer and the presence of defects through thermal degradation. When using this modifier in an amount of 5-30 wt.% for filling PA6, PA66, PTFE provides increased of parameters deformation and strength characteristics due to the increased mechanical component adhesive interaction at the interface of "matrix-filler". An additional effect is realized in the processing of the surface layer of CF fluoride compounds oligomeric or polymer-oligomeric structure. The modified fluorinated hydrocarbon components fragments CF when laser pulse processing are exposed to the active low molecular weight products ablation, so that the surface layers are formed with a high affinity to the matrix polytetrafluoroethylene. The complex method of modifying CF is effective for highly filled fluoro composites containing 25-35 wt.% of carbon fillers due to the decrease in the probability of formation of cluster structures of the filler particles. Dispersed particles silicate (clay, tripoli, talc) and carbon (graphite, carbon black, shungite) when exposed to laser radiation susceptible to degradation with the formation of nanoscale fragments in a moving layer, thus increasing their activity in the processes of the interfacial interaction in the formation of composites based on oligomeric and polymeric matrices.